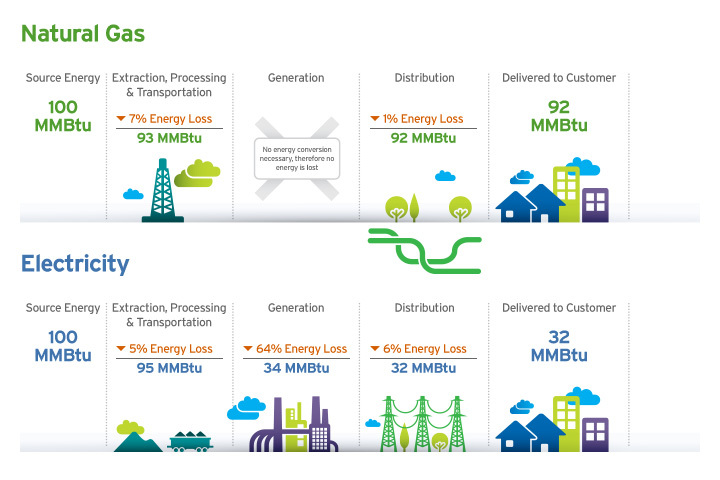 See how natural gas compares to other energy sources. It’s easy to transport and little is lost while being delivered to the end user. New technologies are improving efficiency. Excess renewable electricity can be converted to natural gas, which can be stored until needed. Natural gas is a more efficient fuel source for many applications. Electricity is generated from different sources, such as coal, nuclear power, solar, etc. The environmental impact depends on how it’s generated. Presently, about half of California’s electricity is generated by natural gas. So when we use electricity, we’re also using another form of energy. When you use natural gas for heating, cooking, etc., there is no secondary energy source used. As natural gas is transported through a system of pipelines, 92 percent is delivered as energy after transmission, with only an eight percent energy loss. SoCalGas® is a leader in helping customers use energy as efficiently as possible, through numerous rebates, incentives and educational programs. 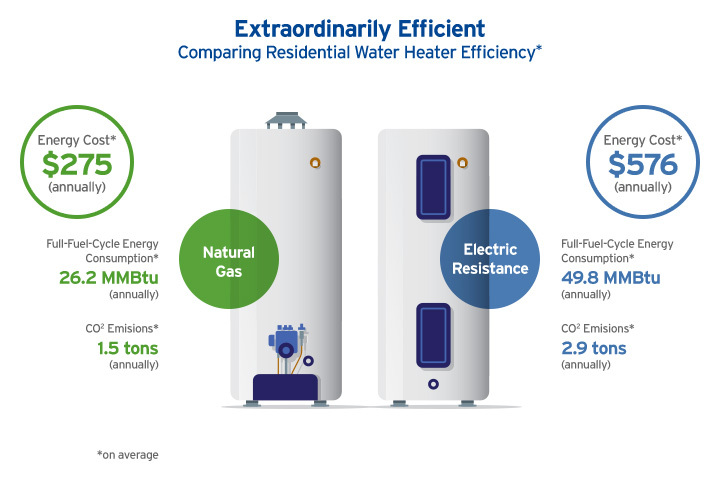 Natural gas is even more efficient for water and space heating. New technologies have helped increase efficiency for homes and businesses, such as solar water heaters, solar thermal chilled water and Advanced Meters, which have helped customers make informed decisions about energy usage. We have many programs to help our residential, commercial, industrial and agricultural customers save energy and money. Through assessments, rebates, incentives, training and more, SoCalGas has helped customers save more than 505 million therms during the last 22 years—that’s equal to taking more than 526,000 cars off the road. Emerging technologies that address the current challenges of transporting and storing electricity are very exciting. One of the biggest obstacles standing in the way of renewable energy is storage. Because we can’t control when the sun shines or when the wind blows, excess renewable energy is generated, but the current electric grid can't store it all, so we end up losing it. Another challenge to renewable electricity is intermittency – it's not continuously available when people need it. Natural gas-powered turbines can quickly ramp up and down based on demand to stabilize electricity generated from solar and wind. Rather than losing the excess electricity that is generated from wind and solar fields, we combine it with water and put it through electrolysis. This technology is called Power to Gas, in which electricity is converted to natural gas so that the energy can be stored, rather than lost. SoCalGas® and partners are leading the way with this exciting new research. SoCalGas recently launched the first Power-to-Gas Project in the U.S., along with the Energy Department’s National Renewable Energy Laboratory (NREL) and the National Fuel Cell Research Center (NFCRC). Power to Gas will convert electricity from renewable sources, such as solar and wind, into gaseous energy. This highly innovative technology is a carbon-free system that could provide North America with a large-scale, cost-effective solution for storing excess energy produced from renewable sources. Distributed Generation is small-scale electric generation located in the community where the energy is used – one example is rooftop solar panels. Others include natural gas-powered micro-turbines that can generate electricity right in your backyard; fuel cells that generate electricity; and co-generation, in which electricity is generated by burning natural gas and the exhaust and heat are captured and put to use for heating. Distributed generation technologies can help us create efficient energy, right where it is needed.